If you have sensitive skin you already know how much of a hassle it can be. You know how difficult it is to find high-quality products that don’t also irritate your skin. So what do you do? Well, you should be taking a look at the best razor for sensitive skin. That’s how you’re going to get a great shave but not irritate your skin. But just what is the best razor for you and how will you know it? Well, we’ve done that research for you, so you can get to shaving. Type: What type of razor is it? Are you getting a cordless option or a disposable? Is it a corded version? All of these things are going to be important and they’re going to be about your own personal preference as well. 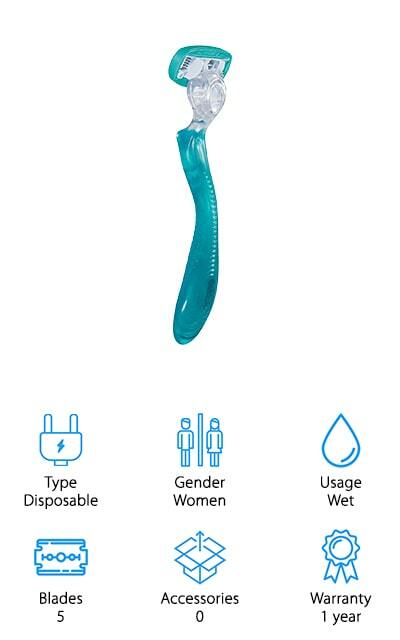 Gender: What gender is the razor designed for? Are you getting a men’s razor or a women’s razor or is it considered unisex? You want to make sure you know what you’re getting and how you’re going to get the results you want. Usage: How do you actually use the razor? Is it best for use on wet skin or dry skin? Are you going to be able to use it for both? This is something that’s a personal preference but it’s something you’ll at least want to know about. Blades: How many blades are on the razor? Blades are going to change the way that the razor cuts, so make sure that you are getting the right number of blades for you. This is another area where it’s going to be personal preference. Accessories: How many accessories are you going to get with the razor? Will you get an extra razor? A charger? Any additional pieces that make the process easier? You want to know everything that’s going to come with the box. Warranty: What kind of warranty can you expect? You want something that you can count on, which is why you need to know the warranty that you have. A better warranty means that the company stands behind the product. You definitely want to get a great quality product and something that will help you get a great shave. That means doing some research, right? Well, not so fast. You can actually get great skin without doing the work because we’ve done it for you. We’ve already found the top razors for sensitive skin so you can make sure you have something you’ll like and that won’t hurt your skin like other razors. Our best men’s razor for sensitive skin is made by a company that’s well known when it comes to shaving. It’s proven to work on 3-day beards and even has 4 blades and accessories that will help you get the shave you’re looking for. The 40,000 cross-cutting actions per minute mean that it can get just about any type of hair easily and the design of the foils means that the shave is closer, keeping your hair from growing back even longer. 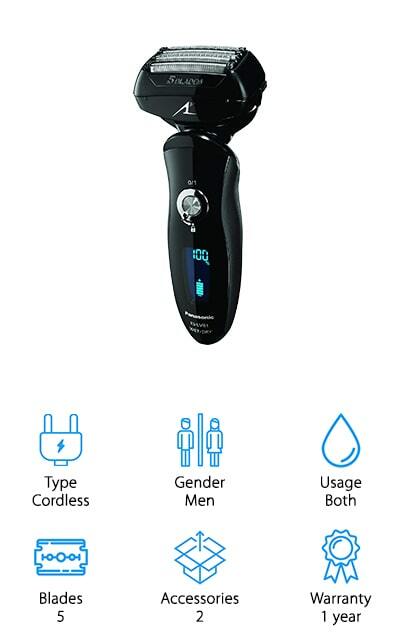 It works great for at home use as well as travel and can give you up to 50 minutes of shaving with a full charge. Designed to adapt to your face, it has a station that not only charges the unit but also cleans and lubricates it for your next use. You’ll be able to choose between different settings as well to make sure you get the clean you want. This is our best face razor for sensitive skin for those on a budget. It’s similar to a disposable unit, though it lasts a little longer. The lightweight plastic of the handle is designed to fit easily in your hand and the unit itself comes with 5 extra refills. There are 5 blades per refill to make sure you get a close and high-quality shave and there are pools of gel to provide better lubrication as well as adjustment for shock and pressure. The razor makes sure that you don’t press too hard while you’re shaving. Great for wet or dry use, this razor comes with a 1-year warranty that lets you know you’re going to have plenty of durability and you’ll be able to get a great look and great shaving as well as trimming for a perfectly styled beard. You’re going to love this best cartridge razor for sensitive skin, that gives you both wet and dry shaving capabilities. 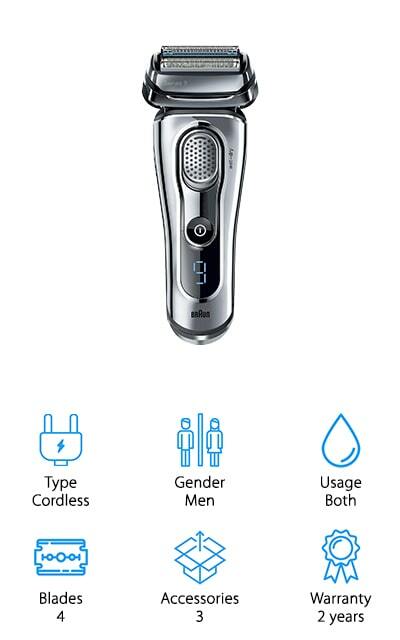 It’s a fully cordless option and offers 3 blades on each unit so you can be sure you get a close shave that’s designed to last. The contour works by flexing inward, tilting inward and pivoting around so that the shave you get is tight to your face. It also has 3 different shaving tracks that can get every hair. Not only that but you’re getting a 2-year warranty that you can count on for durability and longevity. If you really need to get some close techniques you’re going to love the trimmer that pops out for easy jobs around your sideburns and mustache. You’ll also be getting a system that covers at least 50% more than most types of razors. This is our best double edge razor for sensitive skin, providing you with 5 blades that will get you a close shave while still providing comfort. It has 30° angled blades that are hypoallergenic and safe for anyone to use. Not only that but they are ultra-sharp and provide you with 70,000 cross-cutting actions per minute. You’ll have a cordless setup and several accessories that are designed to give you the ideal shave for your beard as well as for trimming sideburns and more. Complete with a 1-year warranty, you’re going to have the durability that you need. The charging station provides not only the charging that you need but cleaning capabilities as well, which means you know you’re going to have a quality system to use each and every time. Not only that but you’re going to have the ability to use it wet and dry. This might just be the best women’s razor for sensitive skin, offering you a disposable option that you can count on to get a close shave. These razors have 5 blades each and come in a pack of 2 so you’re always ready for the next time. You’ll get a ribbon of moisture on the razor itself to provide smoothness and softness to your skin, plus you’ll have a little aloe that will help to moisturize. Get a balanced shave that doesn’t put too much pressure and offers you closeness. There is no warranty on these, but you’re still going to get a great feel and you get a company that has produced razors and other shaving products for an extended period. 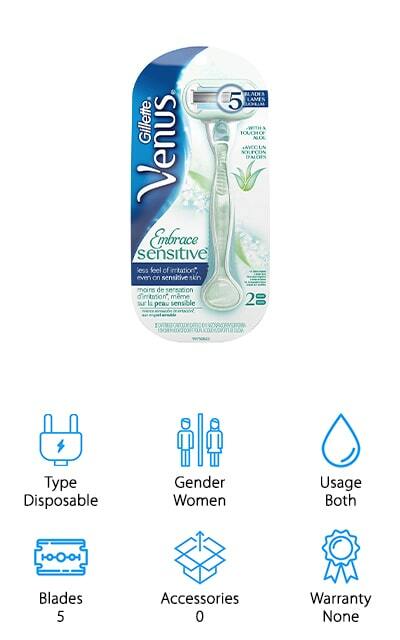 This women’s razor is designed to offer less irritation. 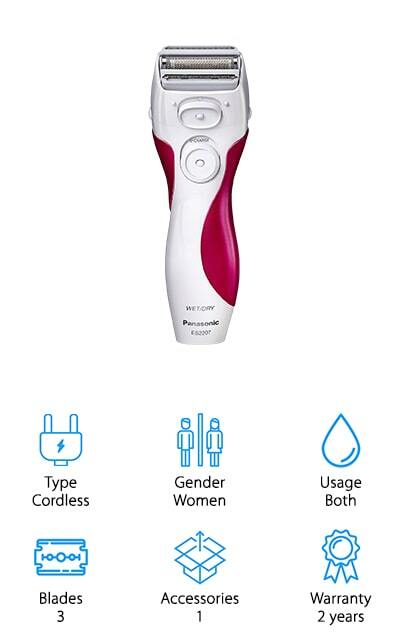 If you’re looking for the best razor for sensitive skin when it comes to women’s electric shavers you’re going to want this one. 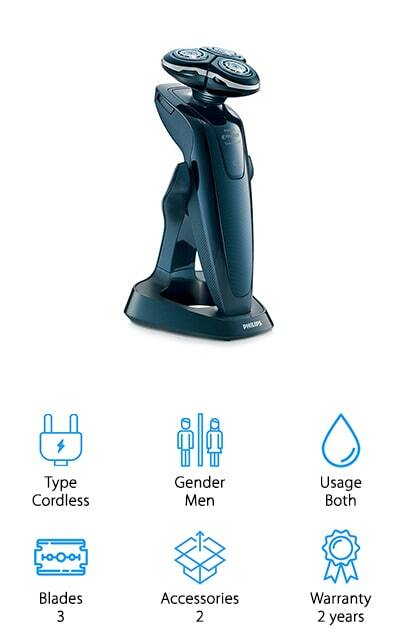 It’s a cordless option that offers 3 blades and accessories to make sure you’re getting a close shave. It offers wet and dry shaving and fits easily in either your right or left hand to provide you with an ergonomic and comfortable way to get the job done. Durable and quick to charge, it’s going to last long enough to get you a full shave with just a single charge as well. You’re going to be impressed with the 2-year warranty and definitely with the fact that it’s received a Good Housekeeping seal of approval. It’s even got a wide blade and a pop out trimmer that gets in close where you need a more direct shave. This is the best shaving razor for sensitive skin when you’re looking for a disposable option that’s made by a company you already know and trust. This one gives you 5 blades on each head as well as a hypoallergenic moisturizing serum that includes Shea butter. That means you’re getting added softness and hydration while you shave. You’ll also have curve sensing blades and skin guards that keep your skin feeling great and make sure you have more closeness with fewer cuts. Dermatologist tested, this razor even comes with a 1-year warranty that says it’s durable and ready to last. If you’re looking for a wet shave razor that you can continue to use with simple cartridges then this is the way you want to go. 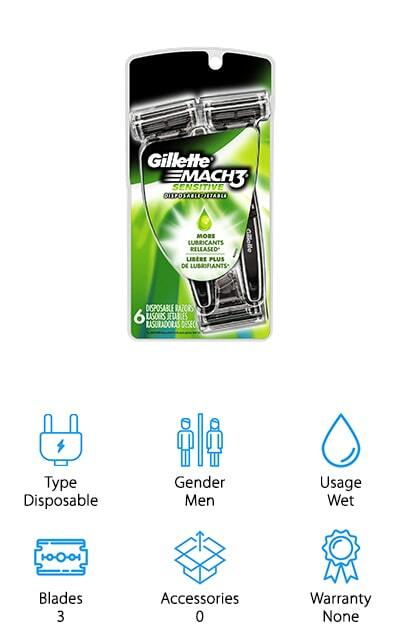 This is the best disposable razor for sensitive skin for men, offering 3 blades on each head. You’ll get 6 different razors included in each pack and while it’s not the best single blade razor for sensitive skin, it’s going to be the best tri-blade razor. It has a diamond-like coating over each of the blades that provides a sharp and close cut. It also gives you an open system that makes it easy to rinse off the blades and has a spring mounted system that makes sure you don’t apply too much pressure. There’s even a Lubristrip that makes sure you glide smoothly over your skin, wherever you need. The softness of the system means that your sensitive skin is going to be better protected and even though you’re not going to have a warranty it’s going to last for a good amount of time with a great quality shave at a low price. 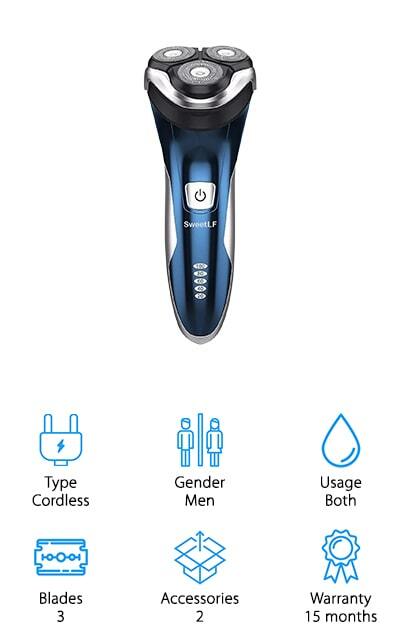 This rechargeable, cordless razor is designed for men who want an option for wet or dry shaving. It has 3 blades that are actually foils, getting you a close shave without you having to worry as much about cuts and nicks. There are accessories to help you get a close shave in even more careful areas like your sideburns and mustache and this unit can give you 120 minutes of shaving in just a single hour. You’ll be able to see the level of the battery from the indicator gauge and you’ll be able to charge it up to take along with you when you travel. There’s a 15-month warranty that says this razor is going to last you a long time and give you the shave that you want. It also has a trimmer and a quiet, but high-speed motor. That means you can get shaved in the morning without worrying about the rest of the family. 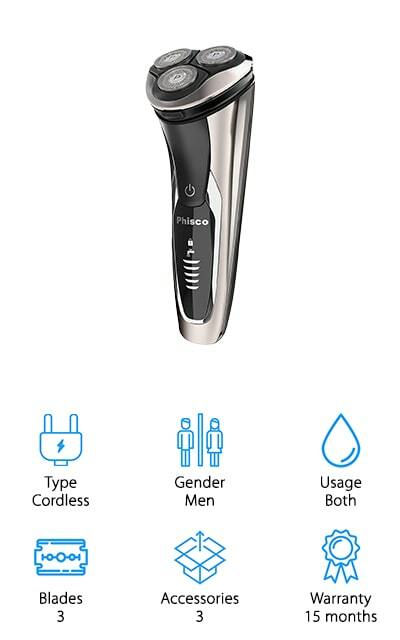 This men’s razor is completely cordless, which means you can get the shave you want without being tied to an outlet. 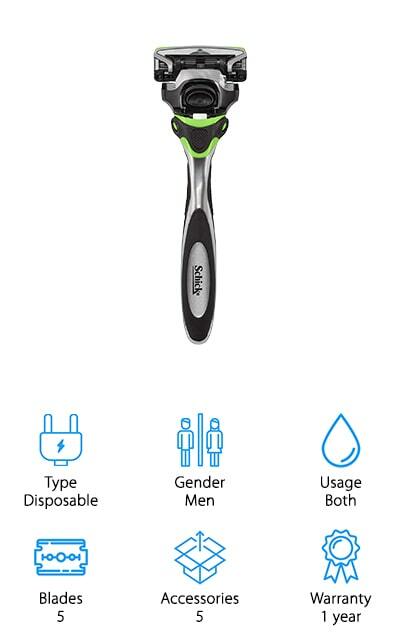 It’s designed for both wet and dry use and even has 3 blades to offer you a close shave over your entire face and neck. It’s entirely waterproof and works well with or without shaving gels. There’s a quiet motor to this system that also works quickly and at a high level of power, so you can get your shave in easily without having to worry about the length or texture of your beard. In a single hour, you’ll have enough power to get you up to 120 minutes of use time and you’ll be able to plug it in directly to a USB if you need to shave it during different times of the day. You’re also going to have 5 different levels for battery power so you can see how your razor stacks up at the moment.